The Far West Local Health District has acknowledged exceptional performance amongst its nursing staff by presenting four individual nurse awards and one nursing team award for 2016. 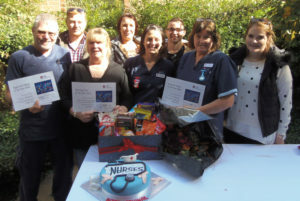 The awards were presented today by Ms Lindy Harkness, A/Director Nursing and Midwifery at Broken Hill Health Service as part of International Nurses Day (IND) celebrations in which the District recognises and pays tribute to its nursing staff. Stuart has been working as a Registered Nurse (RN) at Menindee Health Service since 2013. He followed his dream of becoming a “remote nurse” by initially working casually at Menindee and then full time from 2014. Stuart exemplifies what it is to be a RN. He always follows policy and procedures, and is an outstanding example of meeting the C.O.R.E. values of NSW Health. 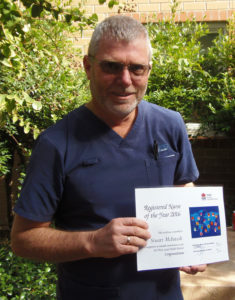 Stuart has undertaken all of the education necessary to increase his skills to become a safe and effective remote nurse and constantly seeks ways to improve his knowledge and skills, including currently completing the final components of a Diploma in Emergency Nursing. Stuart is using his study to undertake a project to improve men’s health in Menindee with his “Men’s Shed” program. He was also the first RN in the Far West LHD to become accredited to use the Nurse Administered Thrombolysis pathway and is currently undertaking the education for implementation of the Nurse Delegated Emergency care program. Stuart goes out of his way to support and educate others in the workplace, including the student based apprentices, medical and nursing students and any other staff visiting Menindee Health Service. Stuart has become involved in the community outside of his work to enhance people’s lives in the community. This involves being part of committees planning various events, as well as church and other social organisations. Stuart also makes time to continue his participation in Rotary in Broken Hill. Alexis Lenton is a skilful young Nurse Assistant who provides a high level of patient centred care. She is reliable and hardworking and has proven to be very caring and compassionate to patients and their families/carers with dementia and delirium. Alexis is a role model for other students and staff. She is professional and enthusiastic and displays a positive workplace culture within the clinical setting. Alexis is an outstanding team member and adapts easily to change and shows great potential as a nursing leader of the future. Throughout her career, Glenys has been a passionate advocate of good patient care. More recently, this passion has been channelled into improving the physical health of mental health consumers in Far West LHD. Glenys manages the Physical Health Clinic in Broken Hill which operates one day per week and aims to engage mental health consumers in addressing their physical health care needs. The depth of Glenys’ commitment to the clinic and her leadership on improving the Mental Health and Drug & Alcohol Services within the LHD, cannot be underestimated. The Intensive Care Unit (ICU) at Broken Hill Health Service received multiple nominations to be awarded Nursing Team of the Year. This is a small and highly skilled team, where a small group of nurses provide excellent care for their patients and work closely with the Ministry of Health in redeveloping the Unit. The team works closely with the Medical Officers, particularly when patients are retrieved to Adelaide by RFDS when they need additional medical support. They work with highly technical equipment and care for patients who have complex and critical health needs, as well as the worried and stressed loved ones of those patients. Their standard of care is high and their commitment to their patients is exceptional and it is our pleasure to recognise this wonderful team and congratulate them on a well-deserved award. Mitchell Firkin was a 2015 New Graduate for Far West LHD. He is now a part of the Transition to Specialty Practice Program, currently working in the ICU at Broken Hill Health Service. Mitchell has been involved in caring for critically ill patients and in quality improvement projects for the Unit. He provides excellent patient centred care and is enthusiastic in his role, building great rapport with patients, families, carers and his colleagues.